The Blogger Team has posted me up as their latest Blogs of Note. Thank you. I’m not sure what to say. I started this to pass along info to those in my profession who were looking for more on Landscape Design. I will continue to do so as long as I have any interest in this profession. Which will be the day I die. When you consider all the things, philosophies, news, stories, tech stuff, etc. out there in Blog World, that the profession of Landscape Design would be considered in this way-well you’ve made my day. Thank you again. To those of you who keep coming back, keep e-mailing me, asking questions, or calling me. Thanks for your support. I appreciate it very much and I will continue to try and make this a site for great information on the World of Landscape Design and all the surrounding elements of this profession. Solve problems: people/clients call us because they need us to remedy a bad situation and make something great happen. Possibilities: A good designer can take an average space/yard; whatever, and turn it into something great, something worthwhile-we improve the quality of peoples lives. Its a great feeling. Nice site. Are you an artist or something? The red pencil sketch looks like art! The sketch looks so nice…I love it…Did you draw it? I always want to draw something like that…and I tried several times…but It never works…I guess I wasn’t born with drawing talents…But I love enjoying in arts and try to imagine what artists are thinking when they are drawing particular pictures…Anyway, Thanks for posting info about landscaping…Your blog is informative rather than entertaining…. Welcome to the blogger front page: the “blogs of note” list. Love your site, would be fun to let you visit Greenland and do some landscaping, our nature is quite different from other areas in the world! I live in the arctic Greenland, Nuuk. 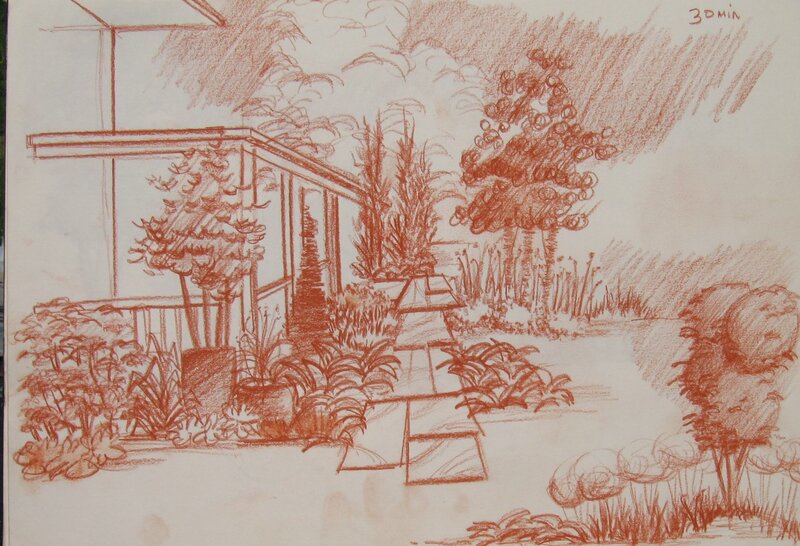 No I’m a Landscape Designer not an “artist” though some would argue that we are, as we work in a 3-Dand 4-D World. I’m glad that I am at least informative, though a little entertainment doesn’t hurt. I’m still surprised I made that list, and I’ve no idea what 7 plants you have up there in Greenland! As to all the kind words-thanks. By what I’ve seen so far you definetly belong on ‘Blogs of Note’.